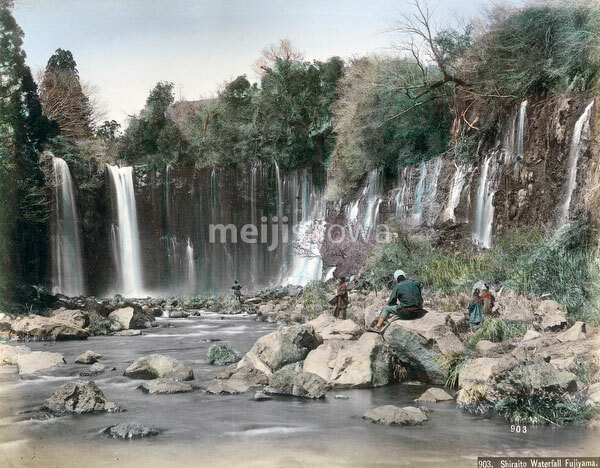 Shiraito Waterfall (白糸の滝) in Fujinomiya, Shizuoka Prefecture, 1880s. The falls are located near Mt. Fuji. It is on the list of One Hundred Waterfalls of Japan (日本の滝百選, Nihon no taki hyakusen), a list of Japan’s most beatiful falls compiled by the Japanese Ministry of the Environment in 1990 (Heisei 2).